Recently I came upon a new entrepreneurship-related show called “Planet of the Apps”, and after watching a few episodes, I quickly get enthused by it. The show is produced by Apple and broadcast on Apple Music and it is essentially an effort by Apple to promote its App Store ecosystem. There are other business related TV shows that I love to watch, like Shark Tank, Dragon’s Den and The Profit, yet Planet of the Apps brings a new angle to the game. The show focuses on tech-entrepreneurs and more specifically “app-preneurs” who leverage the ubiquity and power of modern mobiles and build their businesses on top of Apple’s platform. On each episode, app developers get 60 seconds to pitch their idea in front of the judges: Jessica Alba, Gwyneth Paltrow, Will.i.am and Gary Vaynerchuk. All 4 judges, except their celebrity status, have built and grown successful companies and have experience in business, as well as powerful connections. Alba is the co-founder of The Honest Company, a consumer goods company that sells baby, personal and household products. The Honest Company grew rapidly and generated around $250M in sales during 2015. However, after some controversies growth slowed down, and it recently raised a “down-round” that valued the company at around $1B. Still, no small feat. Paltrow is the owner and CEO of lifestyle company Goop that sells various wellness products and services. Paltrow’s company is smaller than Alba’s and projected 2016 revenue was between $15 to 20 million. Since Paltrow took over as CEO and raised an additional $15 million in Series B funding, Goop is on track to triple its revenue. Goop seems to be on a growth path but has also had its share of controversies. The US is an amazingly peculiar country! Will.i.am’s main business venture seems to be a tech-startup named “I.am+”, which aims to create wearable products that combine fashion and technology. Recently, the company raised over $100m in order to enter the corporate computing market with a voice assistant for customer service. Finally, the most well-known as a business person, Gary Vaynerchuk, is an entrepreneur, four-time bestselling author, speaker, angel investor and internet personality. Vaynerchuk is practically an internet meme, insanely popular within aspiring entrepreneurs. Although I am not totally aligned with his style and business teachings, he has major respect from me. After all, his results speak for themselves. Vaynerchuk was early to the internet game and managed to grow his family’s wine business from $3 million to $60 million a year by 2005. Later, he founded a digital agency named VaynerMedia which boasted $125 millions in revenue in 2017. Vaynerchuk has the strongest business background from the four panelists and it something that shows during the episodes by his comments, insights and feedback. Now, back to the show specifics. After their 60-seconds pitch, if the app developers capture the interest of a judge, they recruit them as advisers and mentors. So far, the idea of pitching to investors or mentors is not unique and many other shows do it. 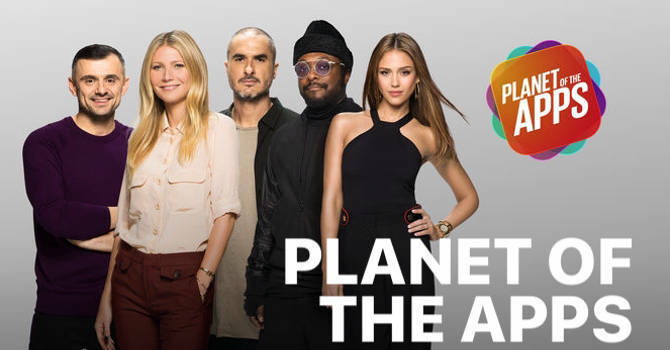 What follows though, is what differentiates “Planet of the Apps” from other shows. Following the pith, the advisers help contestants build their products and prepare their pitch for funding from a Premier VC fund, Lightspeed Venture Partners, who were the first investor in Snapchat. During the short running time of the episode, we get a glimpse of the struggles that early stage entrepreneurs face. Technical difficulties, insufficient funds, faults in their business models, competition from industry giants etc. Apple has also arranged for guest appearances of successful founders and industry leaders, who are usually connections or close friends of the mentors. It is awesome to watch them provide feedback to the newbie entrepreneurs. I am not sharing any names though, as to not spoil the fun! After the “accelerated incubation” phase where the entrepreneurs work closely with their mentors, they pitch again their concept, but this time directly to the VCs from Lightspeed. During that second pitch, their model is torn apart by the VCs which decide if they are willing to invest their money and at which valuation. Many pitches get flat-out rejected, others are declined until they show some better traction, and of course some get funded. Overall, the show is great for the aspiring entrepreneur because it depicts the difficulties of building an app, getting it off the ground, pitching it to a mentor, fine-tuning it and finally presenting before a VC. It is also highly technical both on the business aspects (marketing, financials etc.) but also on the technology aspects (software, design etc. ), so it offers lots of valuable lessons along the way. So far, there has been only one season with ten episodes in total. Check it out, highly recommended!